We are always looking for new ways to increase our audience. Since one key part in our philosophy behind Doll Hospital is inclusivity and accessibility, we hope to develop a broad readership, far and wide across the globe (and beyond?). We also look to reach anyone who might enjoy, be comforted, or helped by the stories our journal envelops. Doll Hospital is a shelter and a safe space for all. If you own or work for a publication and wish to feature Doll Hospital or collaborate in a different way: any added visibility would help us reach these goals, and we are very excited to talk to you! Hop over to our support page or contact us at dollhospitaljournal@gmail.com and we will respond to you as soon as possible. In the meantime, you can already read a few earlier press clippings and interviews, after this note from our much too humble Editor-in-Chief! Whilst I’m honoured and overwhelmed by all the wonderful opportunities I’ve had to talk about Doll Hospital, I’d like to emphasize that this is a collective publication and I’d encourage future press to reach out to other members of staff who have helped make this project a reality and our large team of contributors who have so many stories to tell. Thank you! Now on to some excerpts followed with links to full articles about Doll Hospital in the press. 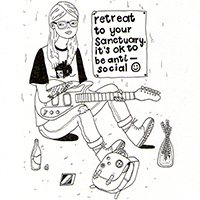 The defiant mental health zine made by and for survivors. There’s nothing much out there like Doll Hospital. It’s an art and literature mental health journal which encourages an intersectional focus. Rooted in self-advocacy, it centres the voices of those who are largely unheard in the mainstream narrative of mental health. It aims to be an alternative and does an excellent job of it. It takes submission from anyone who has experienced mental health illness firsthand and wants to talk about it in their own words and on their own terms. “One of the first questions I get asked is if this project is coming from my own personal experience, and the answer is yes absolutely! I have struggled with mental health issues and suicidal ideation since childhood, complemented with my neurovariance, which when combined can make functioning a bit difficult sometimes. When I saw that there was an Issue Two in the works, I ardently believed this was something I had to be a part of. I never had a writing of mine published in an anthology before, especially not one that focused on the disabled experience. I wanted my writing to showcase my unique story as a disabled woman of color, especially since DHJ is adamant about diversity, particularly the voices of disabled people of color. Working on this submission presented a creative challenge I was determined to achieve; not only for myself, but for other disabled Black women and non-Black disabled women of color who could relate to my plight. Mental health coverage certainly isn’t hard to come by, but mainstream journalism, Lamont argues, tends to focus on neat, upbeat success stories without giving a voice to people struggling with ongoing challenges. Doll Hospital pushes past that in a way that allows people to reclaim ownership of their own messy narratives. Doll Hospital Journal has no precedent like it: it is created completely by and for people with mental health struggles, and we think that’s just how it should be. After all, who might understand the nuances of a sick psyche better than one who suffers it? I think we need to nurture a culture where people struggling with mental health are able to advocate for themselves, a culture where they are listened to and believed. I have heard so many stories of doctors dismissing or undermining patients, and one bad experience may prevent someone from getting the help they need in the future—and that’s wrong. This obviously goes both ways, and I’d like to see a future where the relationship between doctors and mental health patients is not one of fear and frustration. What would you say to someone suffering mental illness? It doesn’t get better, you don’t get stronger, but you survive, you survive and oh my god that’s amazing. This project is important because mental illness is one of those invisible topics that need to be brought up to the surface in order to make some real change happen. But not in that romantic, almost fetishised portrayal of the “sad white girl” which has been popularised in fiction: mental illness isn’t glamourous, it isn’t a fashion accessory and it shouldn’t be used to make a character more interesting because of lack of real depth. It is a struggle, it is exhausting, it is real and it isn’t pretty; which is why creating a safe, supporting and aware environment is so important. Doll Hospital is a bi-annual art and literature journal on mental health. Made by people with mental health issues, for people with mental health issues, it serves as a paper and glue safe-haven from the toxicity of online comments, something to stick in your back pocket and flick through on those days when just breathing can feel like an accomplishment. It’s intersectional – not in some box-ticking, quota-filling way – but because mental health is tied to race, as it is to class, to gender, to sexuality, to disability and just because you don’t look like something out of The Virgin Suicides doesn’t mean you shouldn’t have a voice. Doll Hospital itself is something quite new, where the mentally ill, and more importantly minorities within the mentally ill community are not only encouraged to have a voice, but it is one of the journal’s main aims. In all, Doll Hospital is a beautifully crafted and gorgeous outlet for and by the mentally ill community, with it’s mix of written word and illustration. It’s a treat for the eyes and the mind. Les clichés autour des maladies mentales ont la vie dure. Les mots employés pour les décrire ne sont pas toujours les bons, et rares sont celles et ceux à en parler en connaissance de cause. Pour donner libre cours à des spécialistes et offrir à des personnes atteintes de troubles mentaux un espace de parole, Bethany Rose Lamont a créé le Doll Hospital Journal. Un magazine bisannuel atypique et esthétique, dont chacune des pages s’ouvre sur la tolérance. No matter where you come from, mental health is the one thing that affects us all. But most of us are sick of only seeing the typical tortured male eccentric and white manic pixie dream girl. Doll Hospital aims to move past these stereotypes, giving a voice to those who have felt silenced. Combining touching comics and literary mediums, Bethany Rose Lamont’s journal has shed some light on far-reaching mental health topics in the realms of women’s prisons, Muslim society and disability. Everything is written clearly, honestly, and relatably. Doll Hospital is a comforting and important resource for those struggling with mental health issues and might not find narratives (especially to do with healing or coping) similar to this elsewhere. Also, the artwork featured and the layout of the book is beautiful. The magic of Doll Hospital is situated in its polyvocality. Doll Hospital doesn’t propose a single construct as ‘truth’, instead it allows for a multitude of voices to sing out their own tunes, loud and proud. Doll Hospital is unafraid and holds its head up high as it speaks out in a variety of voices. Its energy is infectious, its topics and tone important. I can’t recommend it highly enough. We’re not some kind of feel good project, we don’t have an agenda or a singular mission. Doll Hospital is just one space to explore mental health in a culture that limits mental health dialogue in so many different ways. I just want to cultivate a pressure free space to explore mental health narratives and experiences that are regarded as too shameful and marginal to merit mainstream reflection. “It’s an art and literature mental health journal with a difference and is making a difference to thousands of individuals looking for comfort, inspiration and insight to support their own recovery journey.